This book comprehensively covers several hundred functions or function families. In chapters that progress by degree of complexity, it starts with simple, integer-valued functions then moves on to polynomials, Bessel, hypergeometric and hundreds more. Keith B. Oldham is a professor of Chemistry at Trent University in Ontario, Canada. He has co-authored several books, contributed to numerous others, and has published over 200 articles. 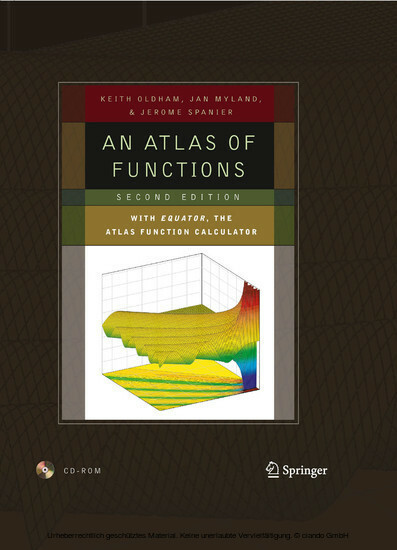 He co-authored, with Jerome Spanier, the first edition of An Atlas of Functions. Jan C. Myland is a Research Associate in Electrochemistry at Trent University. Jerome Spanier is a prominent mathematics professor emeritus, currently a researcher at University of California, Irvine. He has received many prestigious honors and awards and has authored or co-authored numerous publications.